The first day of the Hebron Harvest Fair and the NEHW booth received some visitors. Authors Dan Keohane, Stacey Longo, and Kurt Newton met a number of people and had some great conversations. If you are one of the people who stopped by the booth, thank you for visiting. A number of fairgoers entered the raffle worth over $1,000. If I wasn’t the one running the raffle, I would love to enter and win. A raffle with 42 books including a many signed books including a Stephen King novel. A number of the books are also limited editions. I want to thank some our members Tracy Carbone, Scott , and Longo who donated books. I also would like to thank Chaosium, Inc., Prime Books, Nightshade Books, Borderlands Press, Delirium Books, and Knopf Publicity for their donations. All these people and companies made this raffle what it is today. It was fun seeing the people from Zombee Bob again. NEHW met them at the Enfield Zombie walk in August. This is there second event just like it is ours. Check out the Zombee Bob site, www.zombeebob.com. 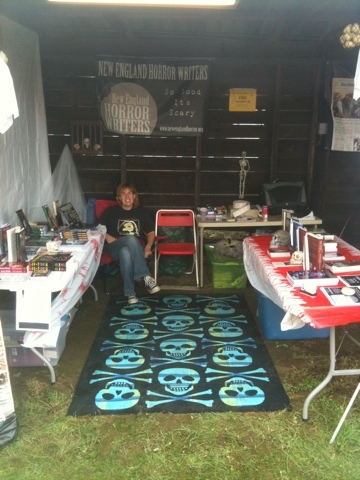 In the upcoming weeks and months, NEHW will be at Rock and Shock in Worcester and Anthocon in New Hampshire. There will be entries on the these events before and after the events. The first NEHW anthology will be released at Anthocon in November. There will be more news coming in the future. The September edition of the newsletter will be coming soon. Don’t forget to read the previous entry about Necon E-Books.